Welcome to Be Thou My Vision	.. a site dedicated to one of the most famous and influential hymns in Christian history. Here you'll find the lyrics to the music, which also contains a devotion on the hymn exploring the meaning of the words and their biblical references. There's also versions of "Be Thou My Vision" with the guitar chords in D major and E major	, and the hymn in Eb Major with a link to some free piano sheet music. In addition there are versions with the original old irish words and a link to the Scottish Gaelic version, as well as links to videos and a link to a free a cappella sound recording. High King of Heaven when the battle is done, Grant Heaven`s joy to me, bright heaven`s sun! Christ of my own heart, whatever befall, Still be thou my vision, O Ruler of all....."
...truely some of the most inspiring words to be found in Christian literature. But how did "Be Thou My Vision" come to be written and who wrote this great hymn? As with any song, there are two elements - the words and the music. The tune to this ancient hymn is entitled "Slane", from an 8th Century Irish melody. The melody is named after Slane Hill - and to an event recorded in the lands history thought to be around AD 433. Tradition goes that the ruling King of the time (High King Logaire of Tara) had decreed that no one was allowed to kindle a fire until Logaire had lit his to announce the start of the pagan spring festival. However, St Patrick defied the royal order and lit candles on the Eve of the festival on Tara Hill (approximately ten miles from Slane Hill in County Meath). 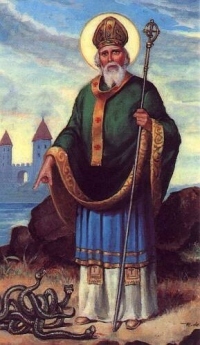 The King was so impressed by Patrick's defiance that he pardoned him and allowed him to continue his missionary work in Ireland. Patrick would go on to convert 100,000 people and establish 2,000 churches. No small feat for a man originally kidnapped by pirates and taken as a slave to Ireland! The original words to the hymn date back as far as 6th Century Ireland, and to the prolific Irish writer Dallan Forgaill (c.530-598), with the original title 'Rop tú mo Baile' . It is said that such was his zealousness for writing poetry and studying that it led to his blindness. In his day, Forgaill reformed the Bardic Order, helping to preserve the Gaelic traditional literature and language. The original words of 'Be Thou My Vision' recorded in Old Irish were used widely in the Monastic tradition before being set to music. The next major development in the hymn came at the turn of the twentieth century, when Mary E. Byrne translated the Irish words into English, recorded in 1905 in the journal of the School of Irish Learning. Another scholar in 1912, Eleanor H. Hull (founder of the Irish Text Society), versified the words. This was to become the modern form of the hymn. Did you know that "Be Thou My Vision" was voted the fifteenth most popular hymn in the UK by the BBC's "Songs of Praise" in 2013? In recent times, 'Be Thou My Vision' has had something of a revival in what is termed "house church" or "new churches". Perhaps the Celtic traditions of wild abandonment to God and the inspiration found within the words of the hymn resonant with this more informal stream of Christian practice.